The European Union (UE) Tuesday indicated that should Jerusalem become Israel’s capital, the old City’s eastern part should also represent the capital of the future Palestinian state, in response to President Trump’s scheduled decision to move the US embassy to the disputed city. 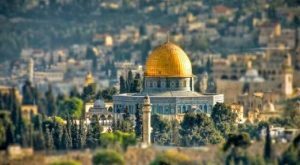 “A way must be found through negotiations to resolve the status of Jerusalem as the future capital of both states,” said Federica Mogherini, the Chief of the block’s foreign policy. The EU top diplomat also warned President Trump to avoid changing the status of the historical city whose fate has been linked up to international diplomacy. There are however contradictory reports about Trump’s plans. While his office said he will recognize Wednesday (dec.6) in a speech Jerusalem as the capital of Israel and the transfer of the US embassy to the city from Tel Aviv, US media reported that Trump is planning to sign a six-month waiver on moving the US embassy to Jerusalem. The White House also said there is no time line for the relocation of the mission but the move could take several years according to observers. These reports come after President Trump told Palestinian, Jordanian and Egyptian governments Tuesday that he intends to move the US Embassy in Israel to Jerusalem, a step that could upend the White House’s peace efforts and spark regional unrest. The announcement by the White House already sparked reactions in the Arab world and much of the rest of the world with several world leaders believing Trump’s decision could tilt the region into further escalation. Hamas promised a ‘day of rage’ on Friday and a new intifada. UN Peace Envoy to the region Nickolay Mladenov has pointed that the US cannot unilaterally change the status of the city. The UN senior official said the fate of the city should be decided by Palestinians and Israelis. “The future of Jerusalem is something that needs to be negotiated with Israel, with the Palestinians, sitting side by side, directly, in negotiations,” Mladenov said. The UN still favors meaningful negotiations between both sides, Mladenov added. Last revised by: Jaber Ali, our reviewer, on December 7, 2017.